Hello to my lovely readers! Unfortunately I have been a rather busy bee the last week or so, so I must apologise for not adding any new content or getting back to your messages! Although I’ve been neglecting the blog I promise it has been for good reasons – I’ve been having lots of interviews for Vacation Schemes and Training Contracts (aka internships and a graduate job for every industry other than law) so hopefully I will have a job before I graduate! Wish me luck! 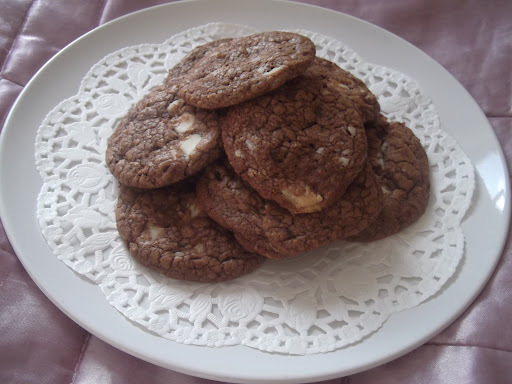 As an apology, I’ve made you these Chocolate Fudge Fridge Cookies. Forgive me?! In between attending lectures and jumping on trains to London I have however had time to do some cooking but somehow managed to find a few spare minutes to whip up a batch of cookies this weekend. If I can, so can you! You will need to set aside an afternoon to make these, not because the recipe itself is complicated, but because they are a fridge cookie and require some time chilling! At the very least an hour will do! This recipe will yield 12 good size cookies but can easily be doubled/trebled if you are making them for a bake sale/party! Cream together the butter and sugar until soft (as if you’re making a cake!) Beat in the egg a little at a time. Then slowly mix in the flour before adding the fudge and white chocolate pieces. The mixture will now start to get stiff! Once it has firmed up even more, cut off cookie rounds about 0.5cm thick. Place them on a greased cookie sheet at least 4cms apart (this may require some batch cooking if you have a small cookie sheet like me!) And place into an oven at gas mark 4 for roughly 10-15mins. Keep an eye on them! Place them on a wire rack to cool and enjoy! 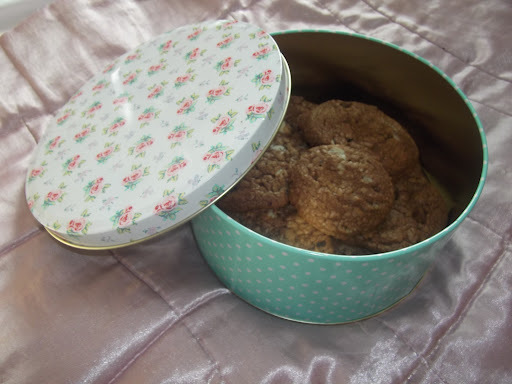 A really good tip from the lovely Kerry at Kerrycooks is that once the cookie mix is in the cling film roll, it can be stored in this way in the fridge or even the freezer for baking at a later date! Then you can always have cookies to hand! Another good tip is that little fudge cubes can be bought in small packets from the kids range at Thorntons! That way you don’t have to worry about chopping up larger fudge pieces.